Cholangiocarcinoma risk factors and fluke associated cholangiocarcinoma. There are many diseases, conditions, and infections which can increase the risk of developing cholangiocarcinoma. A risk factor is anything that increases your chance of getting cancer. Having risk factors does not mean that you will get the disease and some people that get the disease have no known risk factors. The main focus of what we will present here will be on liver fluke infections and their significance as risk factors for developing cholangiocarcinoma. Liver fluke infections are considered to be an epidemic in Thailand and more specifically the North and Northeast regions of the country. It is a common practice for people within these regions to eat raw or undercooked (salted, pickled, or smoked) fish that are infected with liver fluke cysts. In humans, these flukes live in the bile ducts and are identified as a significant risk factor for developing bile duct cancer. 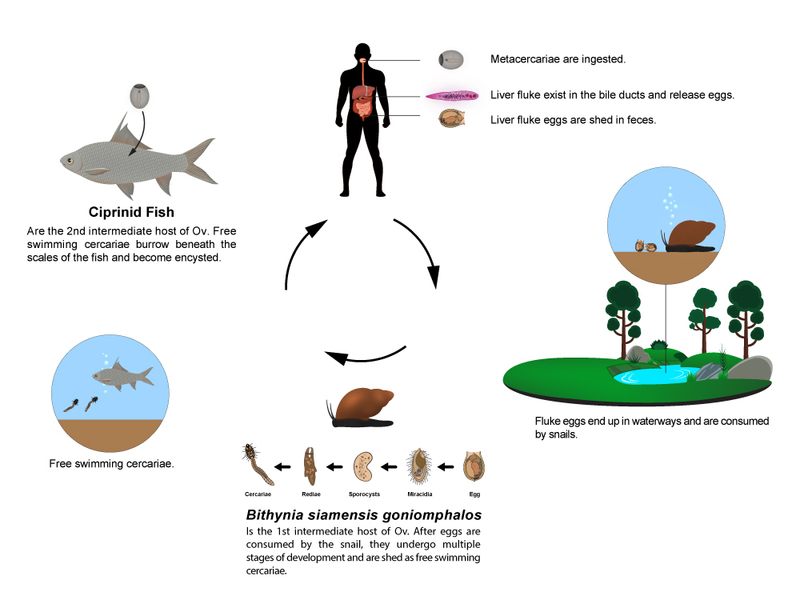 There are several types of liver flukes, however the most common liver fluke infection in these regions are caused by the species Opisthorchis vivirrini, commonly refered to as Ov. There are drugs that can be taken to eliminate the infection and in most cases the risk factors of liver fluke infection can be prevented. When the infection goes undetected and untreated, it can induce an inflammatory reaction and lead to the development of cholangiocarcinoma. CCA liver resection with live liver fluke present. Each adult worm can release as many as 500 eggs per day which are shed from the hosts feces. If the eggs reach a freshwater such as small ponds, reservoirs, streams and rivers, they are ingested by the fresh water snail Bithynia siamensis goniomphalos(first intermediate host). After several stages of development in the snail, they are released as free swimming cercariae (microscopic larvae) and seek out scaly fish called cyprinids (second intermediate host). The cercariae burrow under the scales of the fish and become encysted. In this form they are called metacercariae. People (definite host) become infected after consuming raw or undercooked ciprinid fish that are infected with metacercariae. Once ingested, the encycted larvae excyst (exit the cyst), and migrate to the bile ducts where they mature to adult form and can exist from as many as 20-30 years. In Thailand, at least 15 species of freshwater cyprinoid fish are able to serve as intermediate hosts of Ov. The tradition of eating raw or uncooked fish products is the main reason that liver fluke is a problem in Thailand. This is very popular in the northeastern and northern region, particularly in rural areas. In the northeast, three types of preparations contain uncooked, small and medium-sized, fish: (1) koi pla which is eaten soon after preparation; (2) moderately fermented pla som which is stored for a few days to weeks; and (3) pla ra which is extensively fermented, highly salted fish, and stored for at least 2-3 months. Koi Pla, Pla Ra, Pla Som. The consumption frequency of koi pla in the population of some communities who ate it every week was approximately 80%. Studies found the highest prevalence of liver fluke infection in the northeasterners who ate koi pla. The frequencies of koi pla consumption have declined and are generally confined to special social occasions, while other under-cooked fish preparations like pla som and other moderately preserved fish are generally eaten several times a week. Pla ra and jaewbhong, fully preserved fishes, are an important staple food and consumed daily by 60%-98% of northeasterners. Studies have reported that Koi pla is probably the most infective, followed by the fish preserved for less than 7 days, then pla ra and jaewbhong. It has been reported that average prevalence rate of Ov. 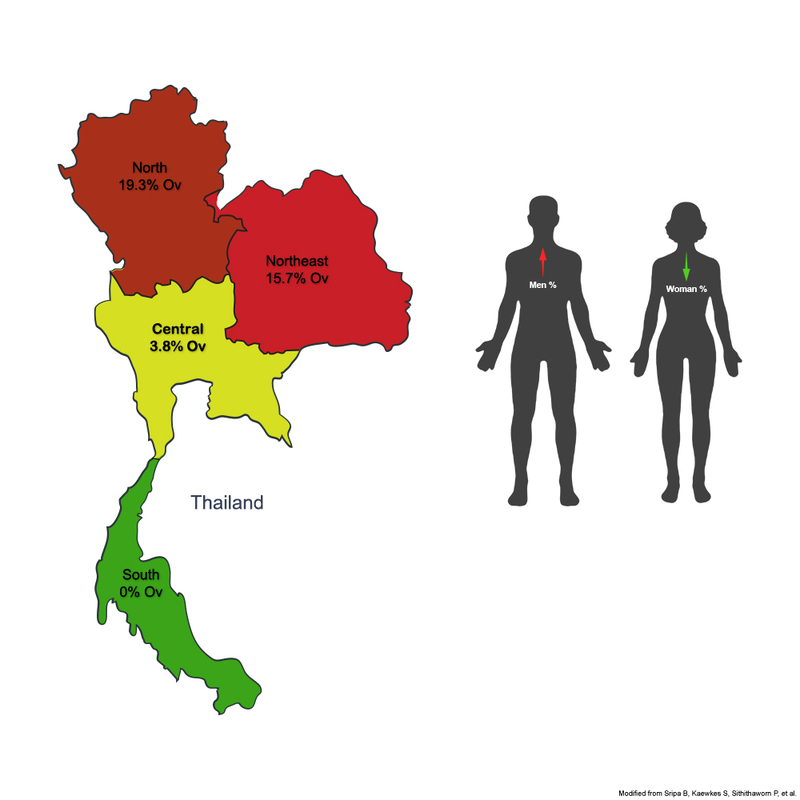 in northern Thailand is >19% and >15% in the northeast. The infection rate increases among the people who are living in endemic areas, ranging from 60 to 80% depending upon the communities. In a community in Khon Kaen, the overall prevalence of Ov infection is 94% and it reaches 100% among the people above the age of 10 years . The tradition of eating raw or undercooked fish products is more common in men than woman and is suspected to be the reason for the higher prevalence of Ov infection in men. Percentage of Ov distrobution in Thailand. – Palmer WC, Patel T. Are common factors involved in the pathogenesis of primary liver cancers? A meta-analysis of risk factors for intrahepatic cholangiocarcinoma. J Hepatol. 2012;57:69-76. – Howlader N, Noone AM, Krapcho M, et al (eds). SEER Cancer Statistics Review, 1975- 2011, National Cancer Institute. Bethesda, MD, http://seer.cancer.gov/csr/1975_2011/, based on November 2013 SEER data submission, posted to the SEER web site, April 2014. Khuntikeo et al. BMC Cancer (2015) 15:459 DOI 10.1186/s12885-015-1475-7: Cohort profile: cholangiocarcinoma screening and care program (CASCAP) Narong Khuntikeo, Nittaya Chamadol, Puangrat Yongvanit, Watcharin Loilome, Nisana Namwat Paiboon Sithithaworn, Ross H. Andrews, Trevor N. Petney, Supannee Promthet, Kavin Thinkhamrop, Chaiwat Tawarungruang, Bandit Thinkhamrop and on behalf of the CASCAP investigators.